Star Warz was created by Mister M & One87 over 12 years ago and it quickly blew up to one of the finest Drum ‘n’ Bass concepts the world has ever seen. A combination of high quality line ups, great artwork, a top class venue and a heavyweight sound-system is at the base of its huge success. Star Warz had almost all upcoming or established artists & labels in the scene over and it is one of the partners of Tomorrowland since day one. Star Warz can again look back on an absolutely amazing year with many mind-blowing parties as the Metalheadz night, 15 Years Virus Recordings & Soul:ution, the Tomorrowland stage and 10 Years of Exit Records. Each of them memorable nights that will go down in the history books of Drum ‘n’ Bass. Before we all go out with our XXL NY event, first we have the president of Drum ‘n’ Bass over at Vooruit on December 20th. 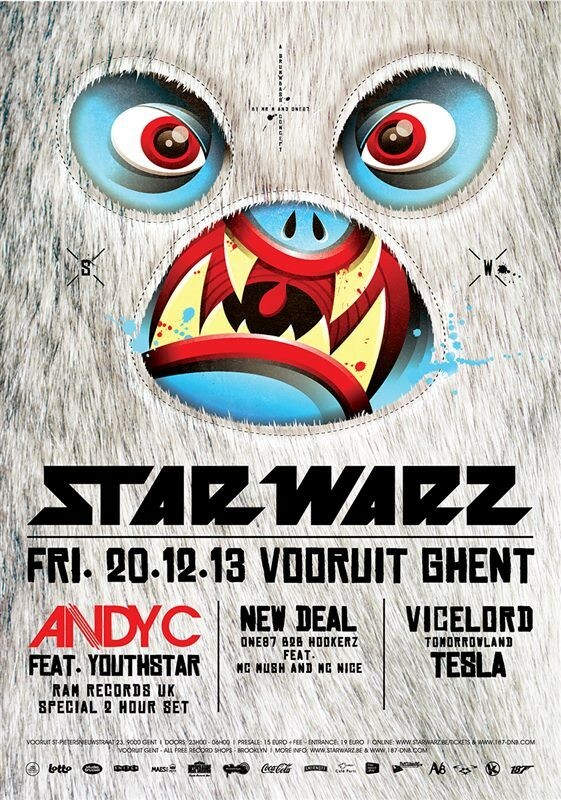 Because this time Star Warz presents a very special showcase of Andy C featuring Youthstar. In the world of electronic music, there are few bigger names than that of Andy C. Regarded as one of the greatest DJs ever to touch a turntable, the Ram Records founder has relentlessly dedicated almost two decades of his life to the music he loves, flying across the globe week in, week out, to demonstrate a mastery of craft that has earned him a status as one of the most iconic and important figures in global dance music culture. Youthstar started his career in France with great dj’s and bands as Elisa Do Brasil and Dirtyphonics with whom he traveled the world. Despite their huge successes, Youthstar decided to go back to a solo career and subsequently won the award for “Best Newcomer MC” at the Drum ‘n’ Bass awards in 2011 and 2012. He then went on to perform with Hospital’s Camo & Krooked and later also RAM Records Loadstar formation. As such, Youthstar’s talent reached the ears of Andy C who has done only a couple of shows with him at only the biggest festivals around ( for example Pukkelpop). Now exclusively for Star Warz, they will be doing it in a smaller venue for the very first time! Two DJ’s & two MC’s performing back2back, bringing fresh Drum ’n’ Bass, that’s New Deal! One87 and Hookerz combine solid mixes and a well balanced selection that covers both new and classic music making their sets anything but a routine and sure to leave you moved. Making the deal even more attractive, the microphone will be carefully handled by two other veterans: MC Nice and MC Mush. Engaged to give it all they got and provide you with the freshest dubs, the best mixes and the freakiest flows, all you need to do is dance! That is the deal! These two massive Drum ‘n’ Bass formations will be joined by great talent from Belgium. First up is Vicelord who is able to bring very versatile DJ sets and always tries to please the crowd with unique combinations of tunes and a very energetic style of mixing with 3 decks. He is a member of the Ostend based collective of Desc, which have been hosting events since 2001 and has had the privilege to play at some of the biggest events in Belgium such as Tomorrowland, Star Warz vs Daily Dubstep, Laundry Day, Stealth Bombers, Steam and many more. From the other side of the country hails Tesla who also plays on 3 decks and has played at nights such as Radar, 10 Years Commercial Suicide night, Conform, Cresst, Steam, … next to being the promoter of the Leuven based Deafinition nights. As always Star Warz has a very special night in store for you: be there or be square!